Frittatas with fresh herbs or seasonal vegetables are a main-stay of our diet, and we often serve them on the weekend for a late breakfast or early brunch. In the summertime, we serve them with fresh tomatoes or roasted peppers and goat cheese; in the spring, we serve them packed with garden herbs or occasionally fresh English peas and pea tendrils. In the autumn and winter, hardy greens and potatoes fill our frittatas. Like the dainty omelets rustic and overbearing cousins, frittatas are less fussy, decidedly easier to prepare and more robust and satisfying for hungry bellies. Of course, all that satisfaction comes at a cost; one good-sized frittata requires about a dozen eggs, providing about eight servings. Take care to use only the best quality eggs available to you – fresh from farms where hens are given free access to green pastures where they can peck at sprouts and bugs. Not only does this provide hens a better and more humane life, but it also increases the nutritive value of their eggs, meaning that your body is better nourished with one pastured egg than it is with three or even four eggs from conventionally raised hens. In essence, the eggs from a pasture-raised hen are simply more nutrient-dense than regular grocery store eggs. Indeed, an egg from a pasture raised hen offers two-thirds more vitamin A, two times more omega-3 fatty acids, three times more vitamin E and seven times more beta carotene than a conventional egg; furthermore, that pastured egg also contains 1/3 less cholesterol and 1/4 less saturated fat than a conventionally raised egg1. Pastured eggs are also higher in vitamin B12 and folate than eggs from hens raised in confinement2. Moreover, pastured eggs are also less likely to be contaminated by salmonella than the eggs of hens raised in confinement, and the conventional method of raising egg-laying hens in cages is considered a strong risk factor for salmonella infection compared to outdoor, free-range and pasture-based methods3. It’s simple: healthier hens produce healthier eggs. Indeed, the effects of battery-cage-based production of eggs are so deleterious both for human health and animal welfare that the European Union has agreed to a complete ban on this method of egg production by 20124. 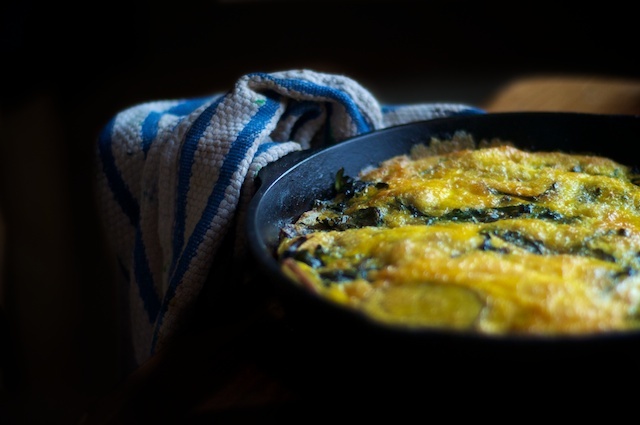 Frittata with swiss chard and potatoes with fresh herbs or seasonal vegetables. I made this on Saturday morning and my husband liked it. I served it along side buttermilk oatmeal pancakes. thanks for the inspiration. Could you help me? For breakfast, we had relied mostly on eggs in many recipes. Just found out my husband has an allergy to egg whites. Yolks are OK. We have our own eggs from chickens raised in our backyard. What to serve for breakfast? Also does not like porridge like oatmeal. I boil the water with raisins or apples, stevia, cinnamon and a pinch of salt. Turn off burner and add rolled oats and let set covered for a few minutes and then serve with milk. I tried soaked oatmeal and he doesn’t like it. Been using potatoes and sausage also but I need more options. He doesn’t want yogurt(not sure he ever tried it tho) Forgot to mention diabetics is another challenge. He loves toast and would fill up on that but I know that is not good for him. Thanks for your help!!. I’d suggest almond flour pancakes. They are a great low carb breakfast. There are lots of great recipes online. Also smoothies where you add raw egg yolks from your chickens. Good luck! Try making your own sourdough spelt flour bread. I see some numbers in the writeup, which seems to indicate references, but cannot find these references anywhere. For example “Indeed, the effects of battery-cage-based production of eggs are so deleterious both for human health and animal welfare that the European Union has agreed to a complete ban on this method of egg production by 2012(4).” Where is the reference which the upper script 4 refers to? References were eaten during a design shift. So, no, they’re not accessible. I just tried this today for Sunday brunch. I used the same amount of chard, replaced shallots w/ onion, and reduced other ingredients to 1/3. Sauteed thin-sliced onion in butter w/ chopped chard stems. Added potatoes next, then chard leaves after potatoes had softened. I used cream skimmed off top of milk; backyard hen eggs; and organic produce: potatoes, onions, & chard. Healthy! Smells great cooking . . . Tasty and satisfying to eat! And a much greener, healthier meal! Thanks for the great recipe!